A clever talking dog named Spot fulfills his ultimate wish to becomeia 'real boy' in this hilarious full-length adventure. $3.602 million on 2027 screens. 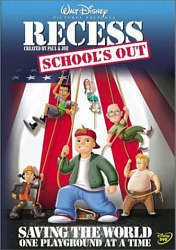 Not one of Disney’s major animated flicks, Teacher’s Pet slipped onto movie screens in January 2004. 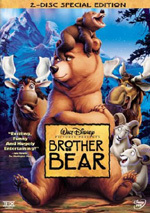 A big screen adaptation of a Disney TV series, the movie snagged a mere $6 million at the box office. Did it deserve such an ignoble fate? Not at all, as Pet provides a clever and amusing fable. We meet Spot (voiced by Nathan Lane), a dog who wants to turn into a “real-live boy”. He lives with nine-year-old Leonard Helperman (Shaun Fleming) and his mother Mary (Debra Jo Rupp), who also acts as the local fourth grade teacher. The household also includes parrot Pretty Boy (Jerry Stiller) and cat Mr. Jolly (David Ogden Stiers), both of whom prod Spot to give us his dream of humanity. However, Spot lives much of his life like a human, as he dresses up as a boy and calls himself “Scott Leadready II” to attend fourth grade along with Leonard. On the last day of school, Principal Strickler (Wallace Shawn) informs them that Mary Lou got nominated for a teacher of the year award and he’ll send her to Florida for the competition. He loans her his Wentawaygo RV, but the canine-hating Stricker allows no pooches on the premises. As such, Spot gets stuck at home, and the prospect of weeks without his buddy Leonard makes him sad. After Leonard and Mary Lou split, Spot sees Dr. Ivan Krank (Kelsey Grammer) on TV. The mad scientist claims he can turn an animal into a human. By coincidence, Krank resides in Florida, so Spot decides to head there and also catch up with his family. He manages to find the RV and hitch a ride. To avoid the “no dogs” rule, he dresses as Scott and gains Mary Lou’s approval. Leonard wishes Spot would just act like a dog, but he reluctantly agrees to help the canine attempt to achieve his dream, with one caveat: if this fails, Spot will finally start to behave like a normal pooch. While the family makes their trek, Pretty Boy and Mr. Jolly watch more TV and see that Krank actually turns animals into hideous mutations. We witness the horrors of Mosquito Girl Adele (Megan Mullally) and Alligator Boy Dennis (Paul Reubens). Because of this, the animals decide to go to Florida to save Spot. They arrive too late, for Spot gets to Dr. Krank and undergoes the transformation. However, since he forgot to allow for dog years, Spot doesn’t turn into a real boy; he becomes a human man. Fairly nonplussed, Spot takes on the name Scott again and plans to go about his life, but a snag occurs. Dr. Krank wants to use him as an exhibit to prove he’s not a nut, and he won’t let them leave. Nerdy and creepy classmate Ian (Rob Paulsen) - Krank’s nephew - soon arrives and helps them split, however. From there the movie follows a few different lines. We see Spot’s attempts to deal with being a man, a notion that complicates when Mary Lou falls in love with him. Leonard just wants his dog back, and Krank continues to try to capture Spot. TV shows that graduate to feature film status walk a fine line. On one hand, there needs to be some reason for them to exist as big screen offerings; no one wants to pay $9 to see something that resembles nothing more than a long TV episode. On the other hand, the movies need to remain true to the original material and retain their appeal in that regard. Pet doesn’t turn into an epic, but it feels like a broader story than one would get in a TV program, and not just because of the length. The animation betrays its televised roots, as the movie looks decent but moves choppily and cheaply. However, the tale elevates the flick to become something more broad and dynamic than one would expect from a television program. Whatever the case, Pet offered a rather entertaining experience. No, it doesn’t match up with the best work from Disney, but it doesn’t really aspire to do so. The big guns from the studio attempt to exist on a grand scale, and they usually succeed; with or without the TV show, I could never see them producing something that focuses on such odd subject matter in this manner. Frankly, there’s virtually nothing to mark Pet as a Disney program. It’d fit in perfectly well anywhere on the kiddie landscape. Indeed, its oddness makes it seem distinctly unDisney much of the time. Not that I really viewed Pet as a kid flick. In fact, I expect youngsters won’t get many - if not most - of the jokes. The satire of Jerry Springer via the Barry Anger Show and a showtune reference to “feeling Von Trapped” will go over the heads of the little ones. The movie tosses out tons of similar gags, and they make it quite amusing for those of us over the age of 7. Actually, the movie featured so much adult humor that I almost wondered what kids what get from it. Pet came across with a tone similar to that of something such as Shrek, as it presents a flip and insouciant attitude. It never takes itself seriously and also presents an attempt to spoof the standard kiddie flick themes. Granted, it buys into them to some degree, especially by the end when we see if Spot embraces his natural heritage or continues to pursue humanity. The movie also displays a Simpsons-style vibe, especially via its musical parodies, most of which seem clever and amusing. Add to that a pretty stellar vocal cast and Teacher’s Pet fires on most cylinders. The film seems too unassuming and quirky to live up to the grandeur of the best animated flicks, but it carves out a nice niche for itself and turns into a winner. 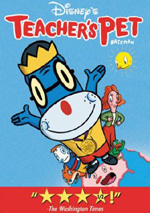 Teacher’s Pet appears in an aspect ratio of approximately 1.66:1 on this single-sided, double-layered DVD; the image has been enhanced for 16X9 televisions. Don’t expect any problems from this terrific transfer. Sharpness consistently appeared precise and crisp. At no point did I witness any signs of softness or fuzziness, as the movie always looked distinct and detailed. No moiré effects or jagged edges caused concerns, and I noticed no edge enhancement throughout the film. Print flaws were non-existent; I saw no examples of speckles, grit, grain or other concerns. Colors offered a highlight, as the movie’s nicely varied palette came through well. Hues always looked bold and bright, and they were a treat to watch. The film often went with fairly basic tones, but they were dynamic and lively. Black levels were equally deep and rich, and shadow detail looked concise and easily visible. In the end, Teacher’s Pet presented an excellent picture. Although the audio of Teacher’s Pet also seemed satisfying, it didn’t live up to the levels of the visuals. The DVD presented both Dolby Digital 5.1 and DTS 5.1 soundtracks. The DTS mix offered slightly stronger bass response, but otherwise the two versions came across as virtually identical. While the soundfield demonstrated a forward emphasis, it still provided a solid experience. The audio spread cleanly across the front speakers, as music displayed good stereo separation, and effects seemed to be accurately localized. Those elements blended together well as they created a neatly realized environment. The surrounds mainly offered reinforcement of the music as well as general ambience, though a few of the action-oriented sequences brought the rears nicely to life. For instance, Spot’s transformation used the back speakers quite actively. Audio quality appeared to be very good. Speech was natural and warm, and I heard no signs of edginess or problems related to intelligibility. Music showed robust and accurate tones, as the score and songs sounded bright and vivid, and they also betrayed solid depth. Effects were accurate and distinct, and they displayed good bass response as well; the low-end aspects of the movie seemed to be rich. Ultimately, this was a fine soundtrack the ably complemented the material. Not many extras fill out Teacher’s Pet, but a few interesting materials appear. We open with a bonus episode of the Teacher’s Pet TV series. Called “Muttamorphosis”, t runs 22 minutes and nine seconds and offers the series’ first episode, as we see the first day of fourth grade and Spot’s initial emergence as a talking, school-attending pooch. Usually I think you shouldn’t watch extras until you’ve seen the movie itself, but this episode offers an exception. If you’re not familiar with the series, it makes a lot of sense to check out “Muttamorphosis” first. It’s quite amusing, and it sets up the show and all its characters and themes. Next we find two deleted scenes. We get “Pretty Boy and Mr. Jolly On the Road” (111 seconds) and “NEATO Awards” (50 seconds). Note that neither consists of full animated material; both show animatics that pair basic audio with filmed storyboards. Both are amusing, though, and fun to see. In The Art of Gary Baseman, we discover a six-minute and 19-second featurette. It shows movie clips, behind the scenes materials, and information from artist Gary Baseman, producer Stephen Swofford, singer Christy Romano, director Timothy Bjorklund, writers/executive producers Bill and Cheri Steinkellner, and actors Megan Mullally, David Ogden Stiers, Wallace Shawn, Nathan Lane, Shaun Fleming, and Jerry Stiller. We get quick notes about the series’ origins, Baseman’s style, and character design. Overall, the program seems fairly fluffy and insubstantial, though we get a nice look at examples of Baseman’s work. A couple of musical features come next. We locate a music video for Christy Romano’s rendition of “Teacher’s Pet”. This mixes movie clips with school-based lip-synch and seems pretty ordinary. Disney’s Song Selection simply acts as an alternate form of chapter search; it allows you to jump right to any of the flick’s 12 tunes. As the DVD starts, we encounter a mix of ads. We find trailers for Aladdin, The Incredibles, The Three Musketeers, and Lion King II: Simba’s Pride. 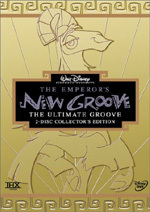 These also appear in the disc’s Sneak Peeks domain along with promos for Mulan and Dave the Barbarian. Brisk and funny, Teacher’s Pet offers a very pleasant little surprise. The movie came and went without fanfare, but it deserved more success, as it seemed fun, charming and amusing. The DVD presents excellent picture plus positive audio and a minor set of supplements highlighted by the first episode of the TV series. Pet provides a kiddie flick that works just as well - if not better - for adults.